The hot-selling Subaru Outback welcomes an all-new Touring edition. 2017 Subaru Outback 2.5i Premium edition. 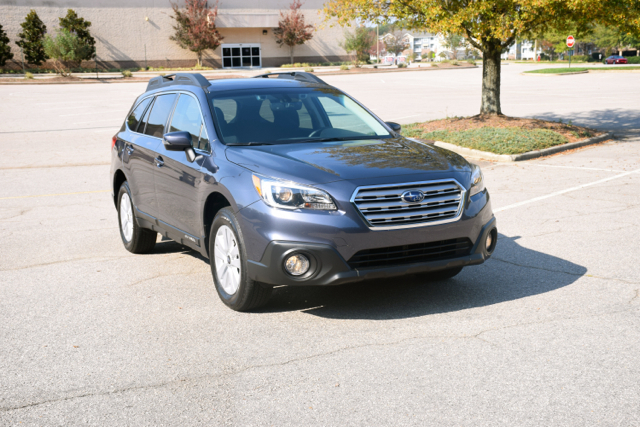 Long before crossovers became popular, the midsize Subaru Outback has established and maintained its own slice of the market. 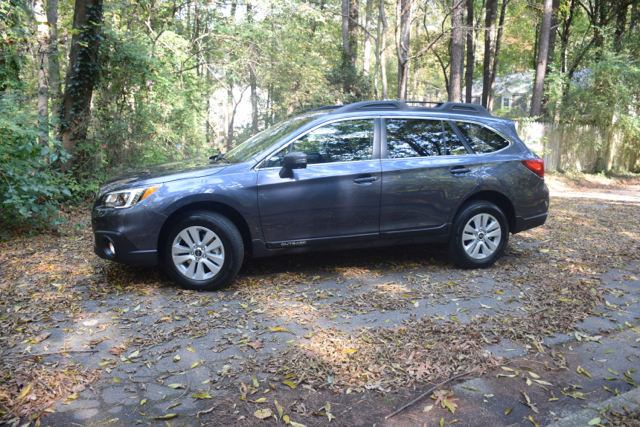 More wagon-like than SUV, the Outback brings in such utility attributes as an elevated suspension, standard all-wheel drive, and versatility — features that keep this model at the top of its game. 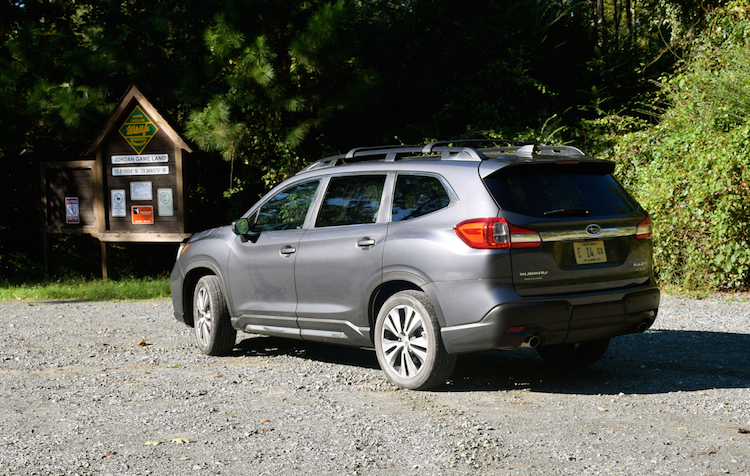 The Outback and Forester are the two top-selling models for Subaru, accounting for approximately 60 percent of all sales. Through October 2016, Subaru has experienced 59 consecutive months of yearly month-over-month growth with the two SUVs routinely topping 10,000 units sold monthly for at least the past 32 months. Chief competitors for this model include the Volvo XC70 and the Audi Allroad. Traditional SUV models such as the Ford Edge, Hyundai Santa Fe Sport, Kia Sorento, and the Jeep Grand Cherokee are a few that come to mind. 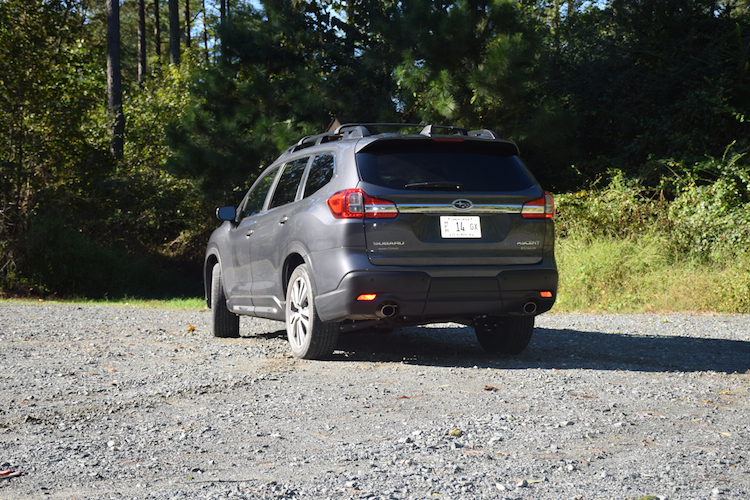 The 2017 Outback is available in six grades or models: 2.5i ($25,645), 2.5i Premium ($27,695), 2.5i Limited ($32,390), 2.5i Touring ($35,995), 3.6R Limited ($34,995), and 3.6R Touring ($38,195). New for 2017 is the range-topping Touring edition. This model has its own exterior and interior trim. All models now come with alloy wheels. The EyeSight Driver Assist Technology package has been improved and now includes automatic high-beam headlight control and reverse automatic braking. 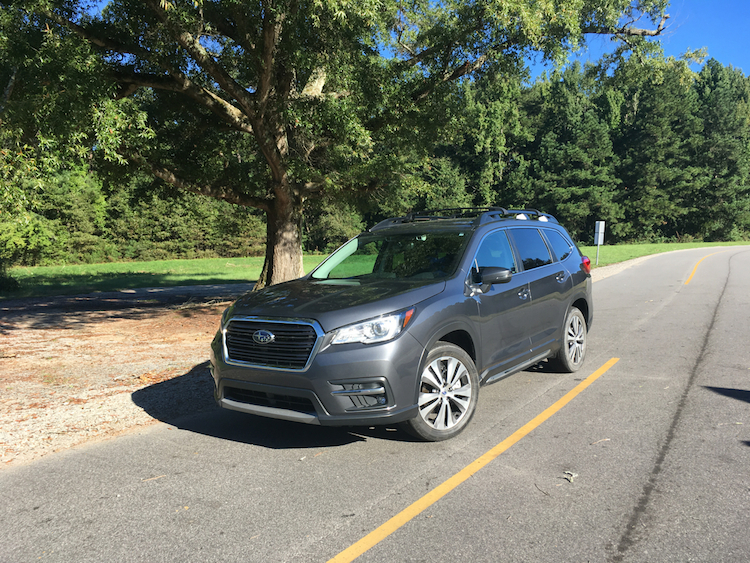 Our test model was the 2.5i Premium and it came with a $3,595 option package — a power tilt and slide moonroof, Subaru Starlink, driver assist features, steering-responsive fog lamps, high beam assist, and a power liftgate. Add in the $875 destination fee and the final price was $32,160. The four 2.5 models are powered by a 2.5-liter horizontally opposed (Boxer) four-cylinder engine making 175 horsepower and 174 pound-feet of torque. These models make 25 mpg in the city and 32 mpg on the highway. The two 3.6 models are powered by a 3.6-liter horizontally opposed (Boxer) six-cylinder engine making 256 horsepower and 247 pound-feet of torque. Both engines come paired with a continuously variable automatic transmission. The EPA estimates fuel economy here at 20 mpg in the city and 27 mpg on the highway. Beyond the now standard alloy wheels, every 2017 Outback comes with fog lamps, all-season tires, power folding side mirrors, and roof rails. Package and trim level upgrades bring in heated side mirrors, a power moonroof, integrated turn signals, and a power rear gate with memory height. Other upgrades bring in black side cladding with chrome insert, body-color exterior door handles, dark gray wheels, a rear bumper cover, and silver-finish roof rails. Top-end models add dual exhaust and HID low-beam headlights. The 2017 Outback offers room for five. 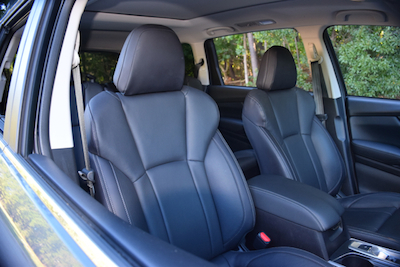 Up front are comfortable bucket seats; to the rear is a 60-40 split-folding bench seat. Interior space is excellent in the front and very good in the rear. 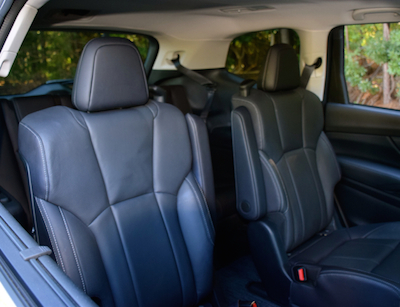 Three can sit on the back seat, although hip space is tight when each seat is occupied by adults. 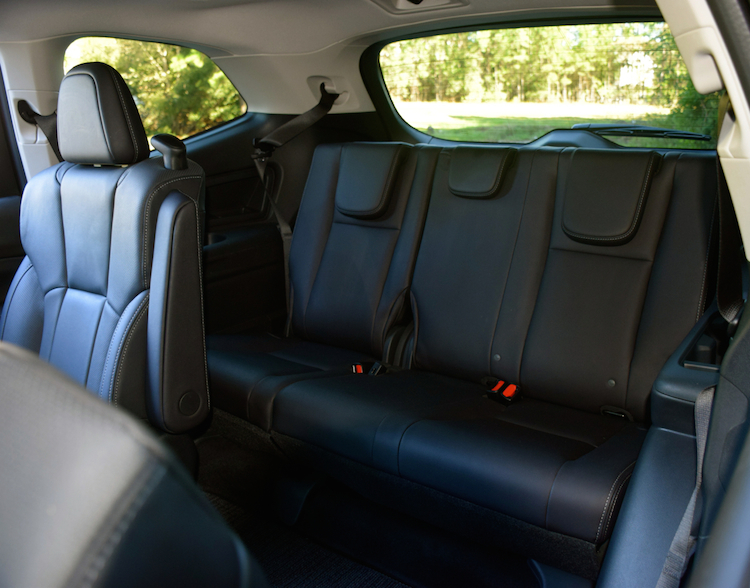 This model offers 35.5 cubic feet of standard storage space and 73.3 cubic feet with the rear seat folded. 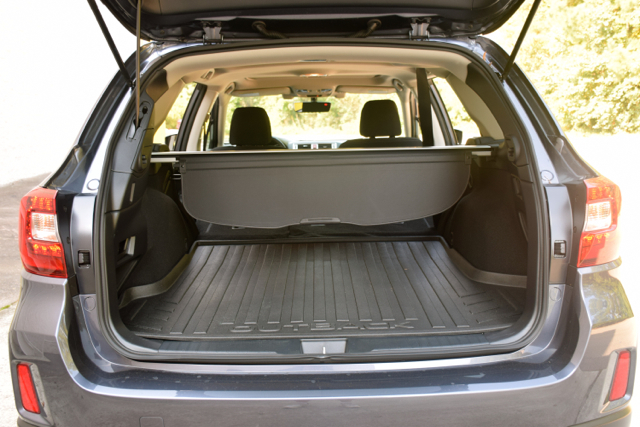 A long list of standard equipment accompanies the Subaru Outback. You’ll find keyless entry, power windows and door locks, cruise control, air conditioning, a tilt and telescopic steering column, Bluetooth, and dual-illuminated vanity mirrors. An overhead console with a holder for sunglasses, a STARLINK multimedia system, and an illuminated front storage tray are also standard. 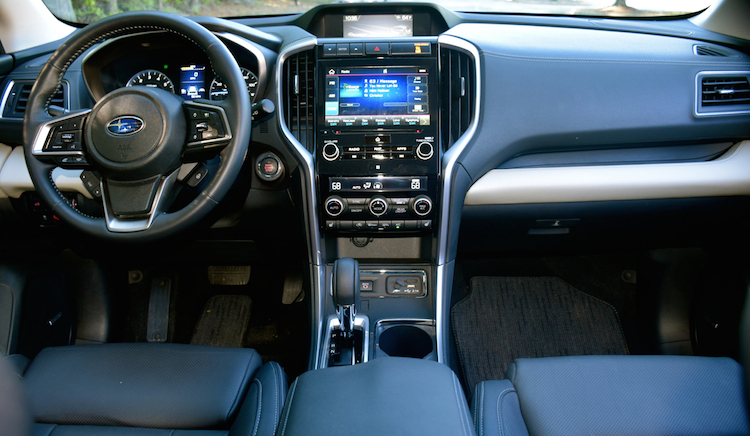 Upgrades include a 10-way power driver’s seat, audio system packages, a leather-wrapped steering wheel, and zoned climate control. 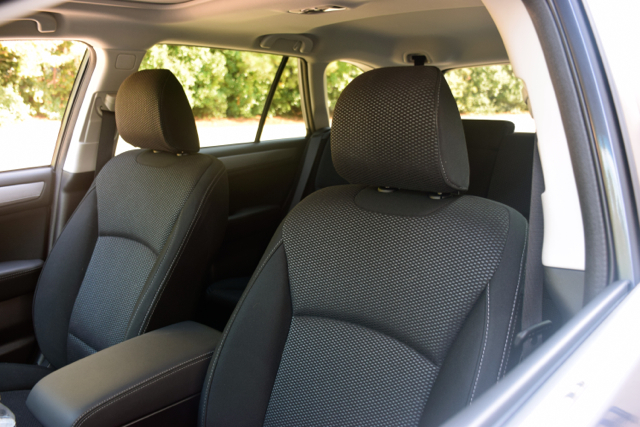 Some models also come with heated front seats, rear seat vent outlets, leather upholstery, and woodgrain trim. 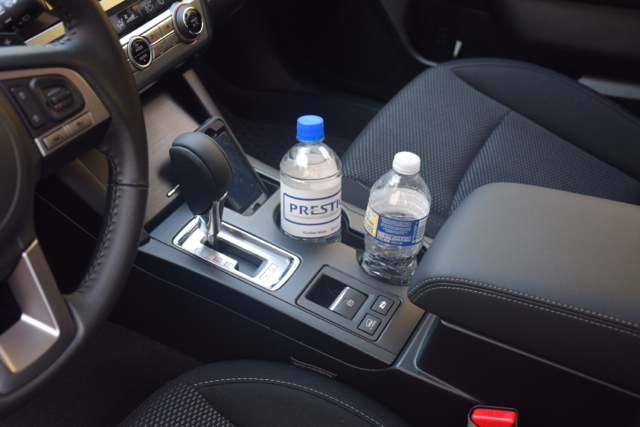 A moonroof package, heated steering wheel, navigation, and connected services are also available. When it comes to safety, the Insurance Institute for Highway Safety (IIHS) gives this model its Top Safety Pick+ award, its highest honor. Benefiting this model and those who buy one is the available EyeSight driver assist technology. EyeSight is available on the Limited and Touring trims only. This package brings in blind spot detection with rear cross traffic alert, reverse automatic braking, and high beam assist. You also get adaptive cruise control, pre-collision braking, lane departure warning, and lane keep assist. All 2017 Outback models come with a full complement of airbags. You’ll also find whiplash-protection front seat head restraints with height and tilt adjustments. Our supplied test model was powered by the smaller engine. We think this powerplant combination will satisfy the vast majority of shoppers in that you’ll enjoy sufficient off-the-mark acceleration and capable passing power on the road. It must be said that if you value quiet, the Subaru Outback will disappoint you, especially when accelerating hard. The engine whines, thanks in part to the continuously variable transmission forcing RPMs ever higher. 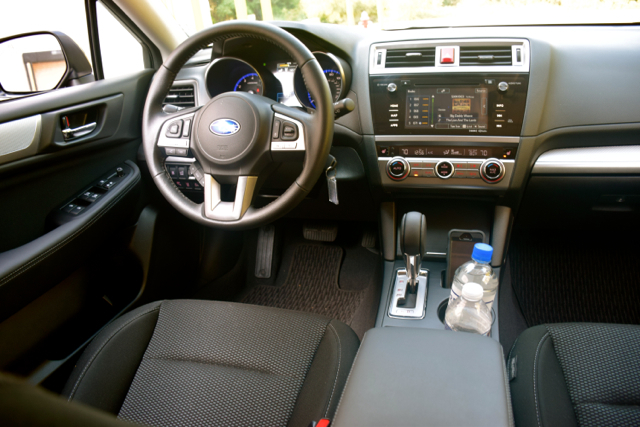 Subaru’s choice of a CVT makes sense as the company is big on fuel efficiency. That’s the exchange made and Subaru buyers are showing their approval through strong sales. On the NVH front — noise, vibration, and harshness — you’ll find more than the usual wind noise seeping through the front windows. But this vehicle is vibration free and the suspension system is robust enough to handle the toughest roads with ease, mitigating harshness. I’m a personal fan of all-wheel drive, especially on front-wheel drive platforms. Subaru’s entire fleet of models — except for the rear-wheel drive BRZ — is all-wheel drive, offering a distinct handling advantage wherever you travel. Subaru used to advertise that its AWD system transfers power “from the wheels that slip to the wheels that grip.” Although the advertising mantra is largely unused these days, that driving dynamic fact remains unchanged and gives Subaru an important edge over the competition. So, what about the six-cylinder option? Upgrading will cost you as the 3.6R Limited begins at $35,000. That means there is no lower trim model offering the larger engine, essentially forcing you to adjust your budget accordingly. 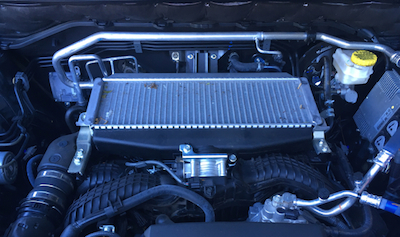 I drove an earlier model year Outback (2014) with the larger engine and can tell you it simply shines — I felt there was more power present than even necessary, but who am I to argue about performance? One area where there is no difference between models has to do with towing capacity: all 2017 Outbacks can pull up to 2,700 pounds. You’ll need to invest in a trailer hitch ($558) to obtain one. Having driven everything Subaru makes, it is no surprise to me that this niche automaker continues to attract a growing crowd of devotees. Top to bottom, the Subaru line is a strong one. The BRZ adds a fun factor complement to the WRX. The supplied test model is an excellent place for Outback shoppers to start and the option package delivers much of what customers want without busting their budgets. 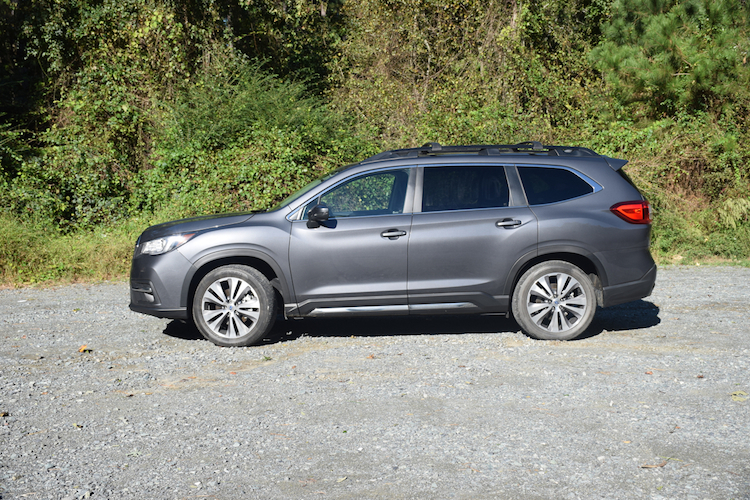 Like other manufacturers, the advanced driver assistance features are available only on the more expensive trim, effectively requiring you to spend more than $35,000 on your Outback to obtain these features. Hopefully, in coming years such features will be made available across all trims, enabling all buyers to opt for EyeSight.